In today’s business world, understanding your customers is crucial. Collecting data can be challenging, but turning that data into useful information or representative statistics is a whole different game. Helps businesses in setting long term goals. The best technique for understanding any data is to visualize it. You can display data in different forms from simple charts to presentations, video infographics, and more. In this post, we will take a closer look at the top 5 ways to effectively present your data. 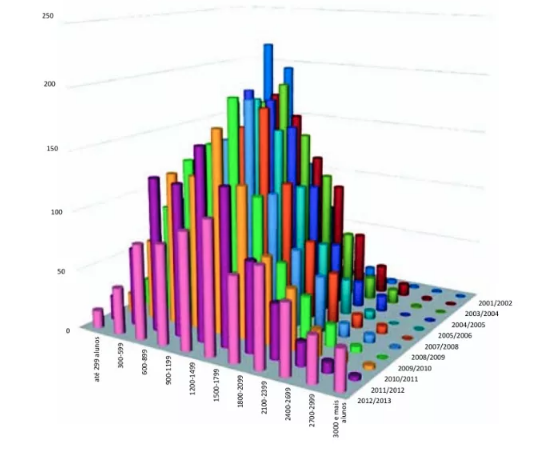 A chart or graph is a visual presentation of data. 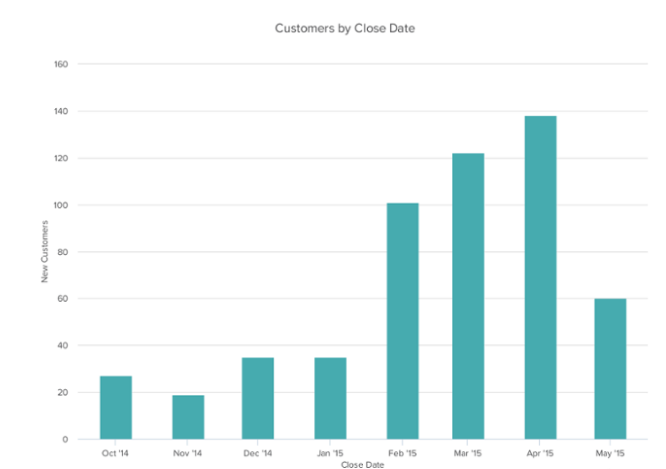 The major goal of using charts is to display your business data in a meaningful way. Good charts convey information easily and quickly to the audience, whereas a bad chart leaves you confused. They highlight the salient characteristics of the data and deliver a convenient method to compare different sets of it. Whether you want to show a relationship, highlight a trend, or make a comparison, charts help the users in understanding what you’re talking about. Have a look at the images below of both good charts and bad charts. 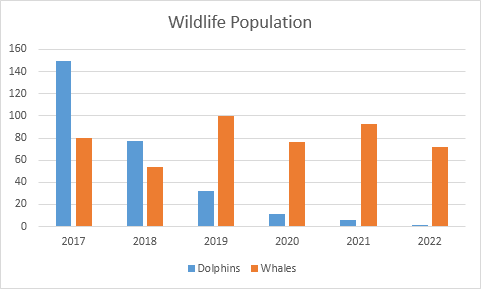 Bar charts are a type of graph used to display and compare the number, frequency or other measures for different discrete categories of data. Bar charts are one of the most commonly used types of graph because they are simple to create and very easy to interpret. They are also a flexible chart type and there are several variations of the standard bar chart including horizontal bar charts, grouped or component charts, and stacked bar charts. Bar graphs are best used to compare things between different groups or to track changes over time. 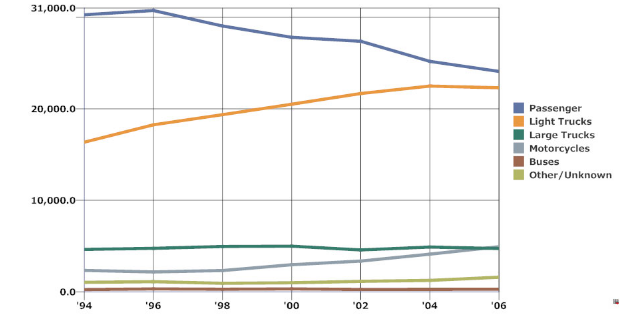 However, when trying to measure change over time, bar graphs are best when the changes are larger. Line graphs are usually used to show time series data – that is how one or more variables vary over a period of time. Typical examples of the types of data that can be presented using line graphs are monthly rainfall and annual unemployment rates. 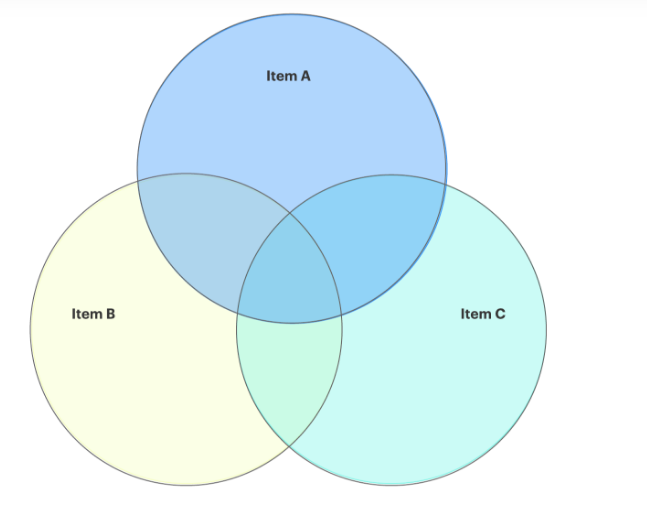 A Venn diagram (also called primary diagram, set diagram or logic diagram) is used to show all possible logical relations between different sets. This diagram uses overlapping shapes, often circles to illustrate the logical relationships between two or more sets of items. This is one of the popular types of charts out there. These are used to comparing parts. Each arc is delineated by building outspread lines from its closures to the focal point of the circle, making a wedge-formed “slices”. The sum of all slices is always 100%. Video infographics or animated infographics are another way to present your statistics. Video infographics are created by combining different animations in one informational video. It helps you in explaining data in an engaging manner. It can add an extra dimension of excitement and provide a brief overview of your business data. Apart from this, visual infographics offer an effective communication source capable of conveying concrete and complex information effortlessly. If you have a killer video infographic idea, it allows you to create a video infographic for your business using a video making tool. From several online video making tools available, you can take help from Renderforest. It is a free video making platform which helps you in building promotional videos, slideshows, intros, special events videos, and more within minutes. Use Renderforest as an affordable, fast and easy-to-use tool to make video infographics and to present your data in more understanding and attractive way. Infographics are another great way to share your business statistics with your audience. 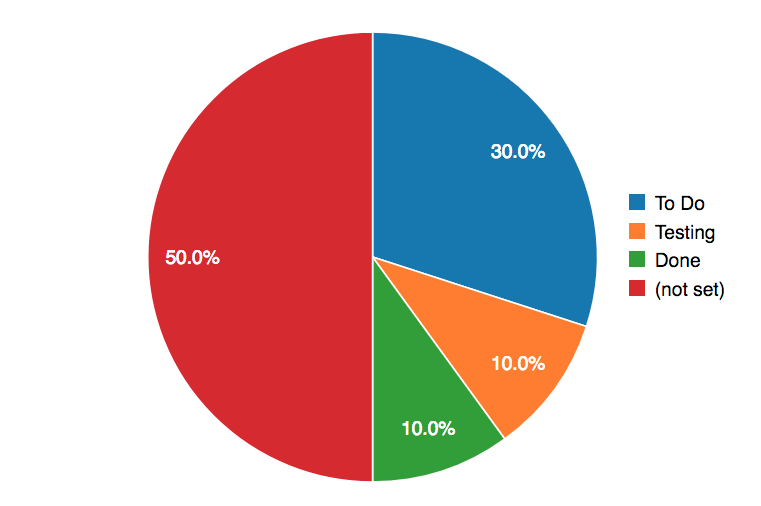 Survey data is easily translated into graphs and charts, making survey results and infographics the perfect couple. 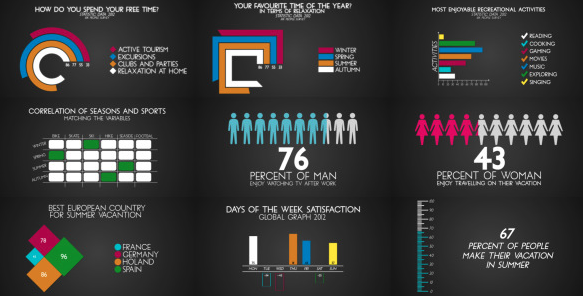 Infographics are not only eye-catching, but they also make your business data look more pleasing and impactful. There are a number of examples of statistical infographics that have gone viral in the industry. 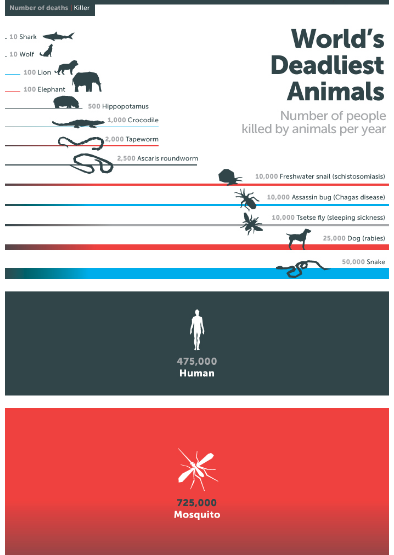 For example, Bill Gates’ World’s Deadliest Animal Infographic. A strong infographic will leave an unforgettable impression on your audience. You can also take the idea from this chart and create something outside-the-box. The best thing about infographics is that they are easy to design and anyone can create them, even without a designing background. 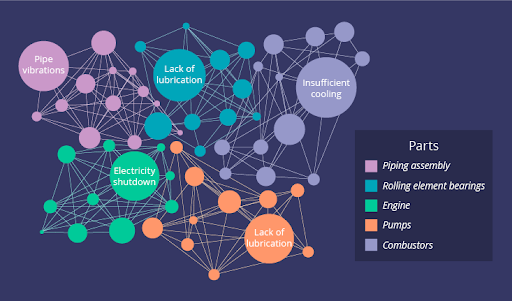 Our friends over at Venngage have written a great article on turning survey data into an infographic. One of the best ways to interpret the statistics is to visualize the numbers as an image. This can help you to see a pattern that is otherwise not visible. According to MIT, the human brain can easily process an image in only 13 milliseconds. This clearly shows the importance of visual representation. To present your data, a visual representation can promote your message and shows statistical information. 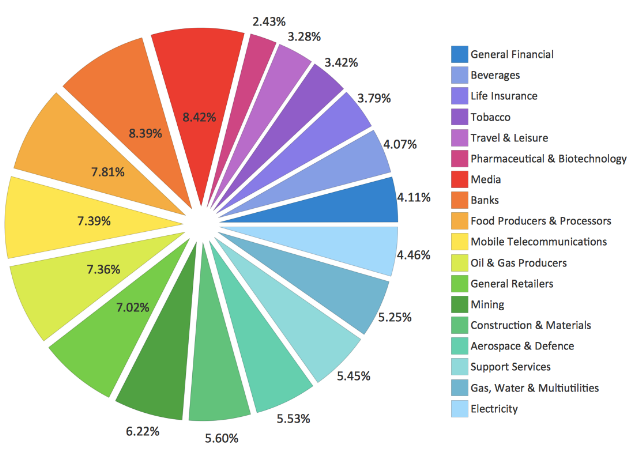 It can be in the form of diagrams, tables or graphs. Horizontal labels to improve the level of readability. Y-Axis to 0 to reflect the precise values in your graph. Remember, for readers visual representations are easy to understand. Statistics presented in the form of visuals can be easily understood compared to long list of numbers. The visual presentation illustrates current trends quickly and is an efficient way to transfer the database information into the reader’s mind. It is also important to keep in mind that poor visualization of statistics can often be misleading. Therefore, to balance function and design is very essential. Visuals that are complex fail to communicate with the audience. Misleading information can also be an outcome of distinctive cultural traditions. For instance, colors might hold different symbolic meanings globally. Last but not least presentations. Data can only work if it is understandable to your audience. The best way to decipher a jumble of numbers, data, and statistics is by turning it into a visual presentation. Have you ever used a presentation for presenting your business statistics? If no, try this now. It is an efficient and famous method to get your message across your potential audience effectively. Creating a data visualization presentation is in itself an art. You need to take into consideration various factors e.g., the type of data you would like to share and the medium for your data. By analyzing your data and selecting a medium, you can design an effective presentation to represent your data. Also, you need to ensure that the presentations you’re creating must be of high-quality and engaging to the visitors. Always keep in mind that there is a story behind every statistic and a data visualization presentation can help you in depicting that story successfully. Graphs, diagrams, and tables are all great and attractive ways to present survey data that is easy to understand. The major reason for using visuals is clarity as some data can be better understood when explained visually. And when it comes to presenting data, nothing is more effective than a table or graph. 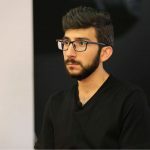 Roman Daneghyan is Chief Marketing Officer at Renderforest, specializing in social media marketing, content marketing, and SEO.